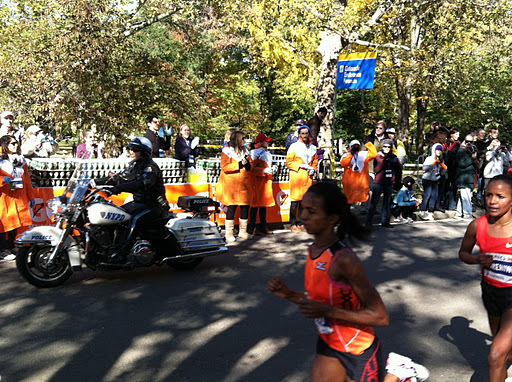 First off a huge congratulations to all of the finishers of this year’s New York City Marathon presented by ING!!! Before yesterday, I always had an appreciation for race volunteers; people who give up their time so that I can do what I enjoy. 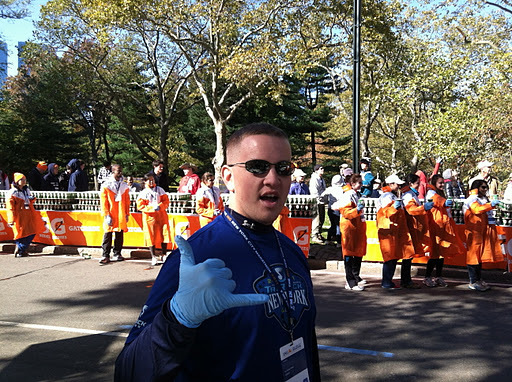 Well, after volunteering at yesterday’s race, I have a much deeper appreciation for race volunteers. Our morning started with a 6 a.m. wake-up (which due to daylight savings time didn’t seem so bad). We got dressed and ready (running tights, sweatpants, under armor mock turtle neck, Newport Half long sleeve Tee, and Tri-Rock, NY Tee) and headed to Dunkin Donuts for breakfast. There, we grabbed an iced coffee and a muffin and headed to catch our 7:06 LIRR train into Penn Station. 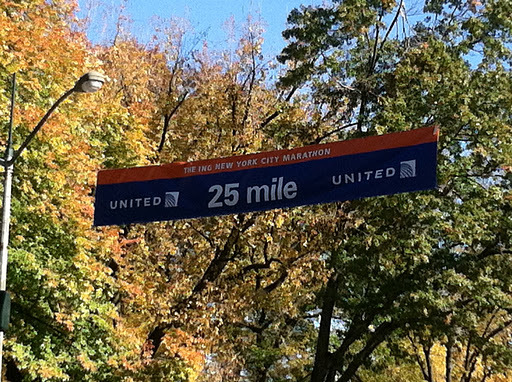 We arrived at 7:45 and hopped on the C subway train uptown to Columbus Circle, and walked three quarters of a mile to the mile 25 fluid station in Central Park. So before we even started any of our volunteer work, we had a pretty full and eventful morning! 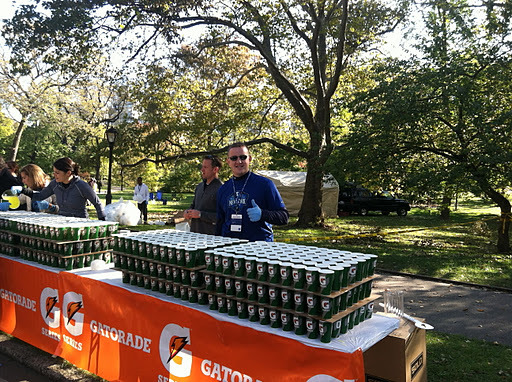 At the fluids station, we jumped in and helped carry and mix gatorade for the athletes who were still preparing to start their journeys through 5 boroughs and toward 26.2. There were eight 10 gallon coolers we used to mix six gallons of gatorade with a ratio of five parts water to one part gatorade. 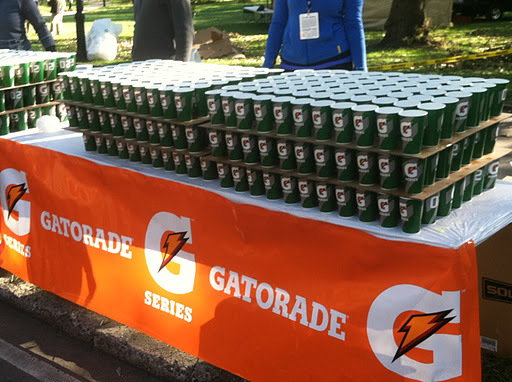 Once the gatorade was mixed, we started pouring cups and stacking them on the tables. Amy and I took control of one table on our own. We filled and stacked two separate stacks of 77 cups, three levels high for a total of 462 cups! Pictured above is the first elite woman to pass the station, followed closely by these next two pictured below! One of these two wound up catching the leader in the last 1.2 to take the race! 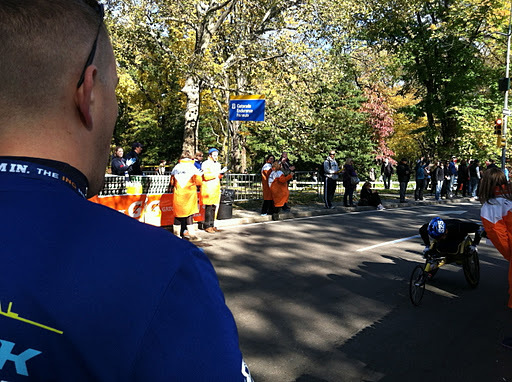 Here is the first elite man to pass us, and yes, he took my cup of gatorade! 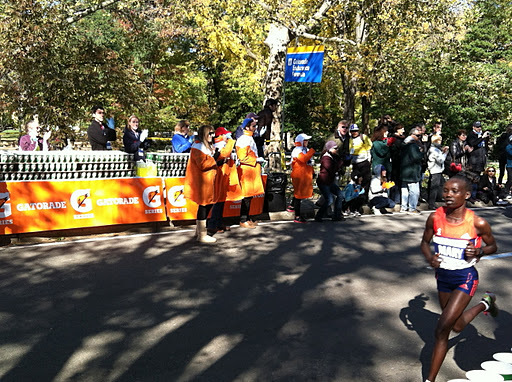 This picture below was taken just after the men’s overall winner took gatorade from me! Notice the people in the back cheering? Yeah, they are cheering for me for having given this man a cup of gatorade! He went on to set a new course record! Probably one of the highlights of my day! Huge smile on my face after a clean handoff to the Men’s winner!! After that from about 11:30 am when a steady stream of runners began coming by until 5:00 pm when the station closed, there was a constant stream of runners. 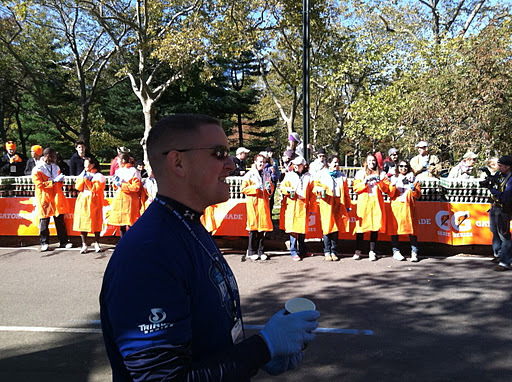 We were constantly handing out cups and refilling our stations. 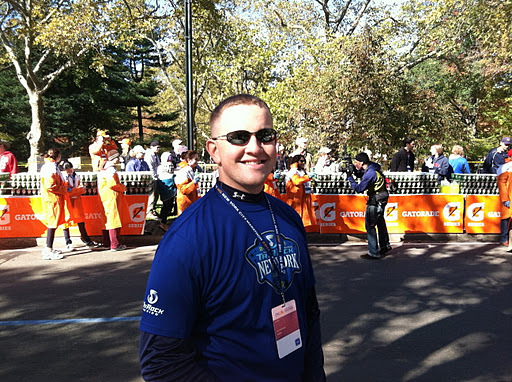 Over 45,000 runners took to the streets yesterday, and all of them had to pass me at one point or another. One face I saw was that of Apolo Ohno who ran a 3:25, almost a full 5 minutes under his goal of 3:30 so a hugh congrats to him! 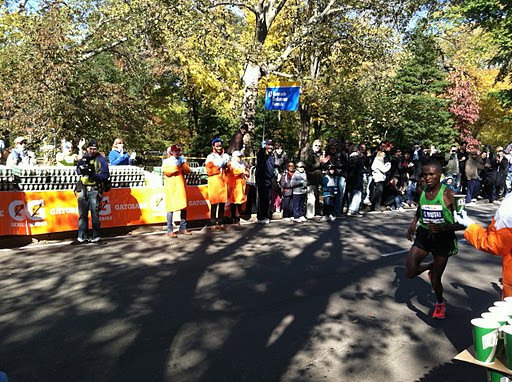 The other celebrity runners managed to slip by in the crowd of thousands, but it was still a great day! Then it was 5:00 PM and I was exhausted! My back was sore, my shoulder and neck hurt from having an extended arm all day; I don’t think I was that sore after some of my races! And, remember that muffin I spoke about eating at 7? That was all I had consumed until 7 PM when I got home. Would I do it again? Absolutely! I had a great time, and it was an absolutely awesome experience! I learned so much, that I don’t even know how to contain it all into one post. 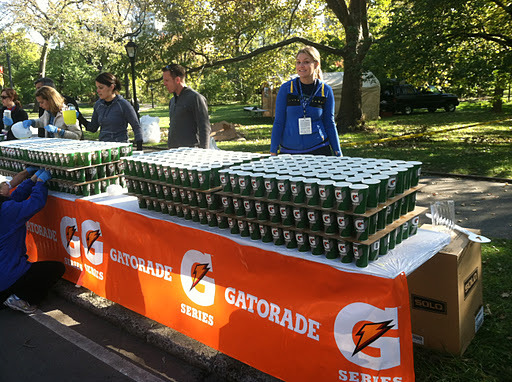 I will have to have another post of how to cheer for runners and how to properly appreciate race volunteers, so keep your eyes open! I will leave you tonight with some more photographs taken yesterday of Amy and myself! !